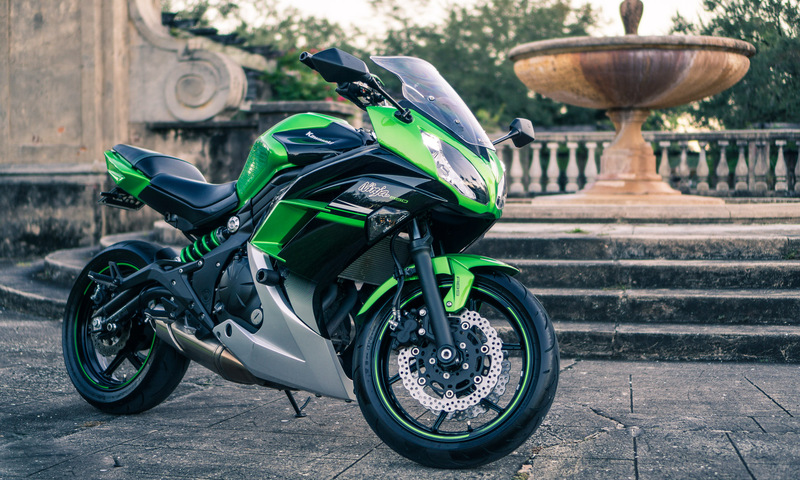 Note – This DIY is based on the 2015 Kawasaki Ninja 300 ABS sport bike motorcycle. However, it should apply to most modern vehicles with the same issue, be it a car or other. The only variation should be the value of the resistor used. Also note that this turn signal LED indicator fix isn’t focused on fixing LED hyperflashing. That’s a whole different, easier to solve, issue. If the dashboard blinker indicator (pictured in green) fails to blink while the turn signals on, this turn signal LED indicator fix will probably solve the problem. For owners who have swapped all incandescent turn signal bulbs out for LED bulbs, the turn signal indicator on the dash does not blink. It stays constant for as long as the turn signal switch is on. That despite the actual turn signals blinking correctly, as well as an LED Turn Signal Relay being installed. 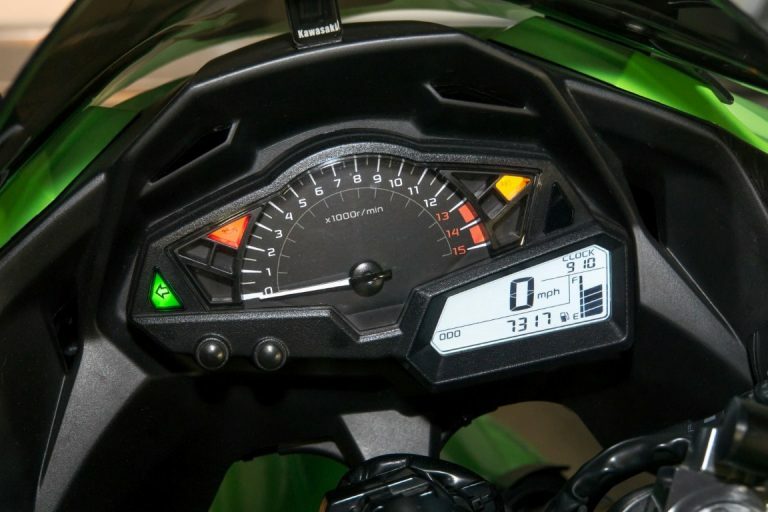 After installing LED turn signals on both the front and rear of my Ninja 300, the LED turn signal indicator on the dash stopped blinking. That is, the turn signals would blink appropriately, but the indicator on the dash would stay steady. I recognize it might be an odd problem, but it was what I was experiencing. Nonetheless, I also know others have also had the same weird issue. When this problem happens, the turn signal indicator on the dash is much less salient. In consequence, you are much less likely to notice that you haven’t turned them off after making a turn. It’s extremely annoying after a while for such a small issue. At least for me – others seem to like it. With some bulbs this may happen. Even if they are all LEDs. And with others it might not. It doesn’t seem to be simply dependent on LED current consumption, since it will still happen even if high power LEDs are used on all turn signal lights. It’s more dependent on the turn signal bulb design in particular. So you can’t know in advance if you’ll have this issue without installing the bulbs. In any case, it’s a problem bugging me enough to look for a turn signal LED indicator fix. Apparently the LED bulb which serves as the turn signal indicator inside the dash operates a bit different compared to the turn signals. It isn’t simply wired in series or parallel. That’s why the turn signals can flash while the dash indicator stays constant. I’ve seen some not totally convincing arguments for this, so the reason this happens is still unclear. Nonetheless, the end result is that the dash indicator apparently is looking for some sort of resistive load which the LEDs are not satisfying. That’s what this turn signal LED indicator fix achieves. If you have this problem on a motorcycle, you should NOT be using oversized Load Resistors for cars. 2x 1w 220 Ohm Resistor – This is all you should need for the turn signal LED indicator fix. It should take care of the blinker dash signal staying constantly on. And the best part is that it will only cost you the change that’s been in the bottom of your wallet for months. If you can’t find 220Ω resistors, 150, 200, and 270 Ohm are also fine in most cases. Just make sure it has a wattage of at least 1w. 500 Ohm Potentiometer – If you want to find which is the exact value of the resistor you need, you’ll have to use a variable potentiometer like this. Doing so, you can minimize the current the resistors spend as heat. Considering most bike’s small batteries, that might be worthwhile. 32 Value 1w Resistor Assortment – It might be easier to simply try specific resistors and not have to buy a potentiometer. With this kit at least you’ll know you already have the right value load resistor. It’s just a matter of testing them to see which one works best. Multimeter – We’ll use this to measure the current consumed by the resistor, as well as the value of its resistance. Alligator Test Leads – These will be used to test different values of resistors to make sure it works before permanent installation. Electrical Tape – Used to wrap and insulate the exposed stripped wires, as well as to create strain relief. Liquid Electrical Tape – This will provide extra moisture protection to the stripped wires. Hobby Knife – Used to strip the turn signal bulb wires without cutting them. Flush Micro Wire Cutters – To cut and trim the wires and resistors. I love these things. Cable – Some regular 16 gauge automotive speaker cable should do. Rosin Core 60/40 Solder – Though in general crimping is better than soldering on vehicles, in this case I’d most likely solder. Soldering Iron – An adjustable 60w soldering iron is probably going to be your best bet to properly solder these wires. The solution is simple, however it is hard to find the correct component advertised as such online. The typical product is the big “Turn signal load resistor” in an obscene wattage and amperage. That’s totally unsuitable for our bikes! Not to mention much more expensive, and 10 to 50 times bigger than it has to be. 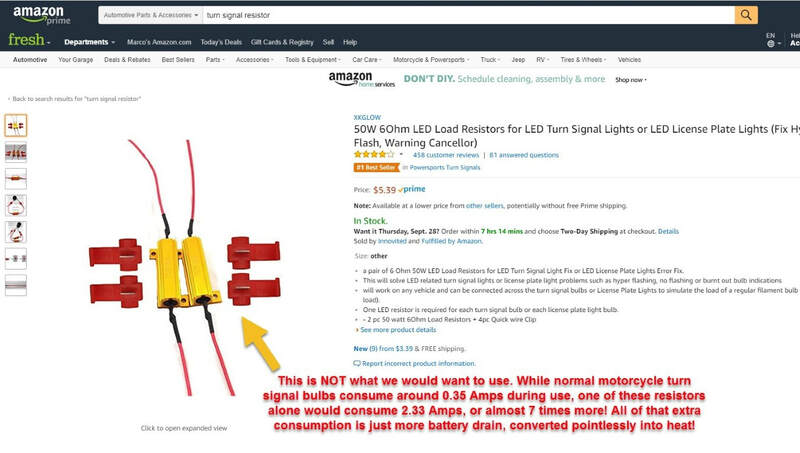 In other words, DO NOT use the 10-50w Turn Signal Resistors advertised online. It is not the right solution for this problem. The correct solution is to use the properly sized 1w resistor, once we find out what that proper size (read resistance) is. 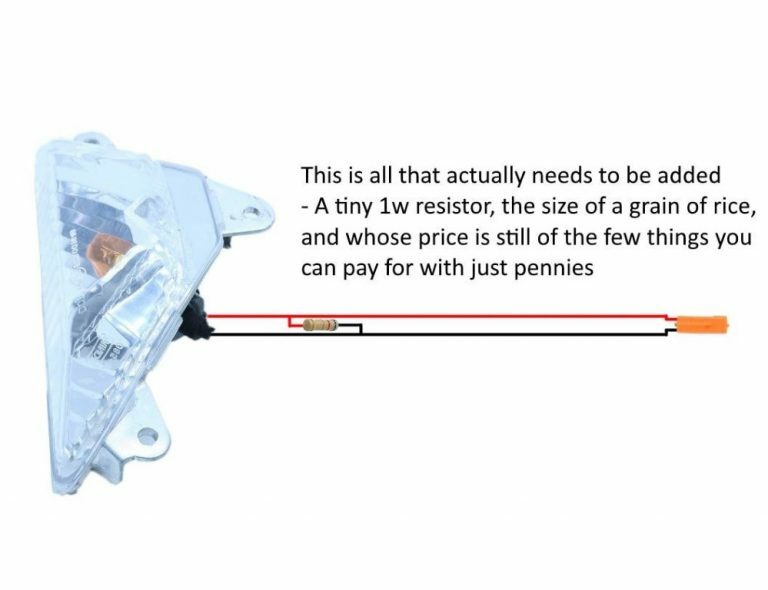 The easy way to solve this is to buy a couple of “220 Ohm 1w resistors” and install them in parallel with the turn signal bulb. You’ll need to install it on both sides of the turn signal circuit. However, only one resistor per side is needed (Left and Right – not per bulb). That is the simple answer and should solve the needs of 99% of the people with this issue*. For people who appreciate doing things the “right” way, or want to use the exact value, read the custom turn signal LED indicator fix. *That was the case with this 2015 Kawasaki Ninja 300. Given that most motorcycles use the same size 5w bulb, it should work for most people with this issue. Regardless of the motorcycle brand. Nonetheless, your mileage may vary. You really shouldn’t use regular load resistors to fix the dash indicator not blinking. The exact values that can or should be used can vary. In order to select the right resistor, you want to select the largest one (Ohms-wise) you can get away with. This is because all the resistor is doing is putting an extra resistive load on the turn signal circuit, and converting that consumed load into heat. The Turn Signal Load Resistors you will find advertised as such are typically around 6 or 10 Ohm resistors. Normally in a wattage in the 10-50 Watt range. When installed, these resistors consume around 32 watts or 2.3 Amps (a lot) and get hot as hell. You don’t want this. I initially tried one, and within seconds I don’t doubt it would have melted plastic on contact. That is wholly unsuitable for a 12v circuit! The resistors consume much more than the LED turn signal bulbs would! Or even the incandescent bulbs they are replacing for that matter! To boot, all that electricity is wasted turning it into heat. This is completely undesirable in small motorbikes with tiny batteries and mediocre charging systems. The actual resistor needed consumes about 0.72w or 0.05 Amps. That’s 4600% less current draw! What a brutal difference. The automotive load resistors are the size of a 9v battery, whereas the suitable 1w resistor is more like a bloated grain of rice. It can even be installed right alongside the wiring which leads to the turn signal bulb itself. They get uncomfortably hot to the touch after a while, but little hotter than that. The Ohm rating determines how many “amps” the resistor consumes. That is how much it wastes as heat. If the ohms are too small, it gets closer to representing a short-circuit and the amps consumed rise. Less ohms means less resistance to current flow, hence higher current flowing. This is “bad”, since it’s wasted electricity. You want the largest Ohm value (aka lowest current draw) that still makes the dash indicator blink strongly. That instead of either staying on constantly or fading on and off as if it were an incandescent bulb. 220 Ohm is the value I found suitable. The Wattage rating represents how much of a load the resistor can put up with. In other words, how much heat the resistor can dissipate without burning up. This value is selected after the ohms are selected. You simply choose the next value up. That’s how you choose a load resistor’s specs. If your resistor consumes .72w (you calculate this knowing the voltage of the circuit and the resistance of the resistor), you choose the 1 Watt resistor. If it consumes 0.4w, you buy the 1/2 Watt resistor. 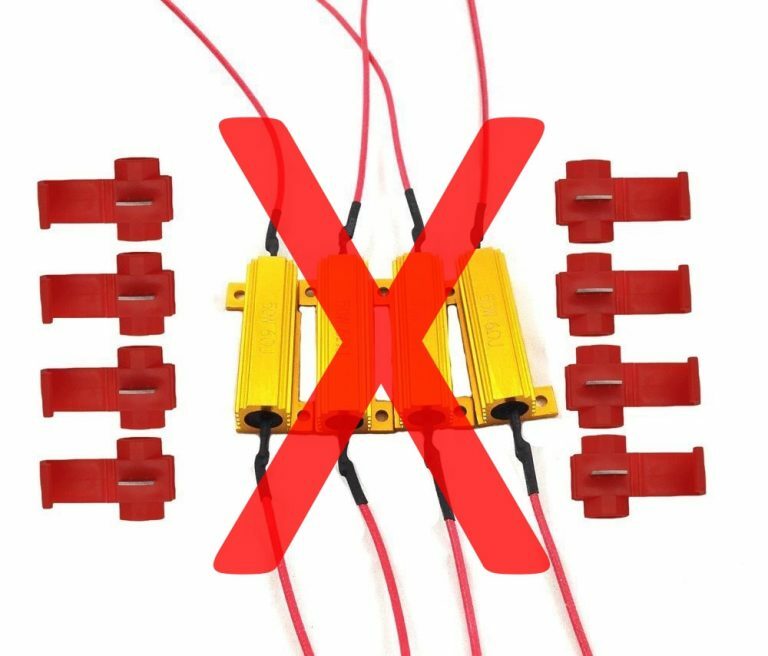 There is no disadvantage to selecting a larger Watt rating, besides a bigger and more expensive resistor. One factor to take into account is that the turn signals have a 50% duty cycle (half the time on, half the time off). In theory you could get away with half the wattage. But in practice it isn’t worth it, and the extra wattage is a margin of safety that compensates for the insulation around the resistor protecting it (like heat shrink tubing, electrical tape, etc). This section is for anyone who wants to know how to calculate the best value for the load resistor. Or for my future reference in the future. The best and quickest way is actually to do it experimentally. If you want, this is how you can find out what value you need empirically. Since the method the dash indicator works by is known only to Kawasaki, this is the best option. To do this, get your hands on a variable resistor with a 1-500 Ohm Range. A 1-1000 Ohm potentiometer would also work. You want it to have a 5 watt rating at minimum. Since I didn’t know what to expect I used a huge 100w variable resistor. It was an utterly over-sized choice, but perfectly suitable. To start testing, remove some of the insulation from both positive and negative wires on the wire leading to the front turn signal bulb housings. Connect a separate alligator clip lead to both wires, then connect those leads to the variable resistor. You have to put the variable resistor in parallel with the turn signal bulb. The variable resistor has 3 connections. Between the two extreme connection points the resistance is always the maximum resistance value of the resistor. The value dictated by the knob is between one end and the middle connection. Connect one cable to one end, and another cable to the middle connection. Resistors are not polarized, so it doesn’t matter which cable connects where. The only precaution is to not connect both leads coming from the turn signal cable since that would be a short-circuit and would blow the (replaceable) fuse. Also, never turn the knob to 0 Ohms since that would also be a short-circuit and also would blow the fuse. Neither should create permanent damage, just the hassle of changing a fuse. Nonetheless, it isn’t worth the risk. To find the correct value for the turn signal LED indicator fix, start with the value of the variable resistor at the largest value possible. That would be 1000 Ω for a 1000 Ω variable resistor. This will be the closest value to an “open-circuit”, and will have the least amount of current draw. Turn on the bike and switch on the turn signals for the side the variable resistor is connected to. 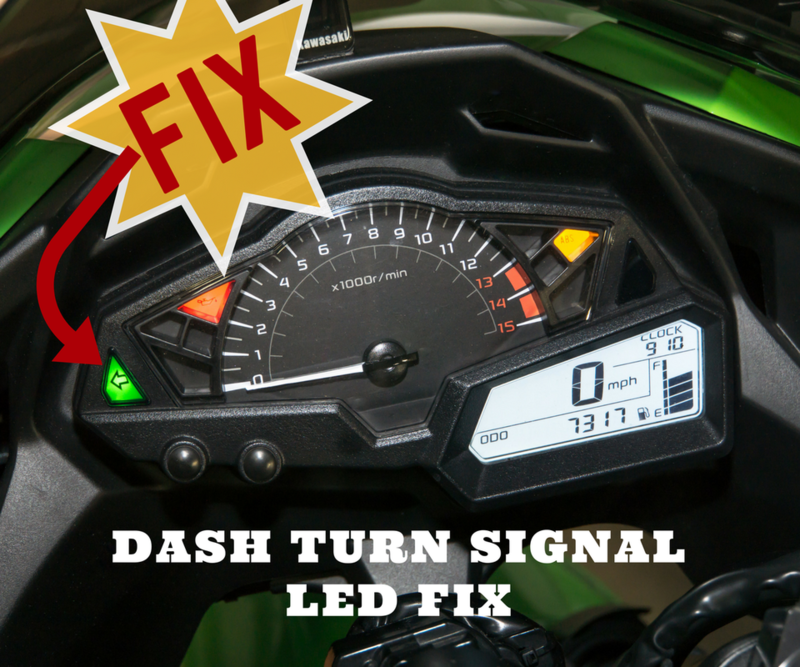 Read the right value you need for the turn signal LED indicator fix. With the variable resistor at the largest value, the dash indicator should stay constant and nothing should be different. This is because the potentiometer doesn’t yet consume enough current. Slowly turn the variable resistors knob in the direction of lower resistance. At some point, the dash indicator bulb will start flashing slowly and fading off and on. As if it were an incandescent bulb. Keep turning the knob until the dash indicator bulb sharply flashes on and off with no fading. This is the correct value of the resistor you need. 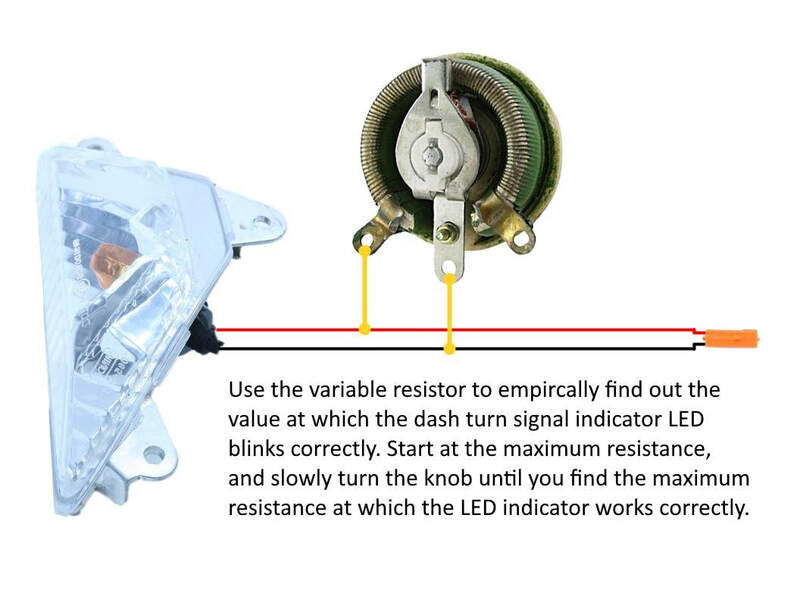 Once you have found a position of the knob you are satisfied with, turn off the turn signals and disconnect the variable resistor. 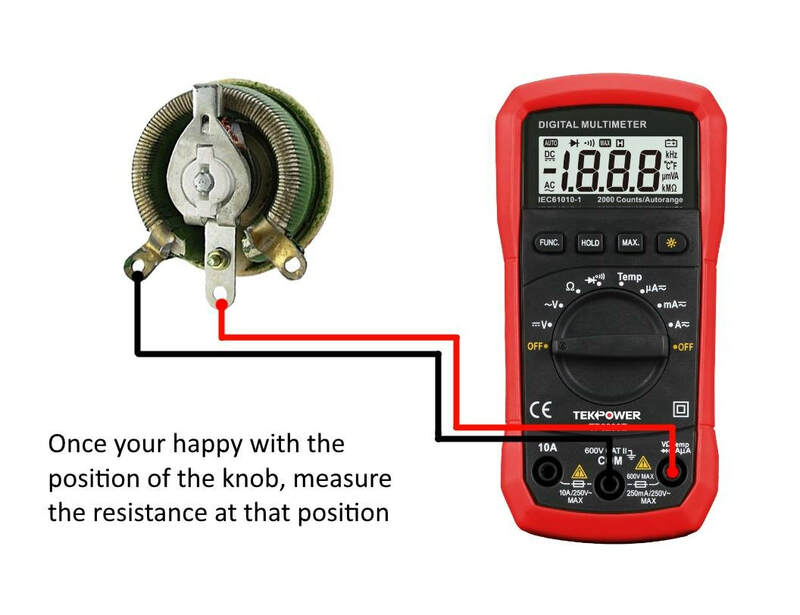 With a multimeter, read the value of the resistance of the variable resistor. You should be reading between the connections you connected to the turn signal circuit at. That’s the value you need for the turn signal LED indicator fix. In my case, the value at which the dash indicator light started fading on and off was around 330 Ohm. At 300 Ohm the dash indicator light was flashing strongly with no fading. As a margin of safety, I selected the next lower available resistance: 270 Ohms. Furthermore, 220 Ohms would be a safer choice, at the expense of a negligibly higher current load and more wasted electricity as heat. Either is a sound choice. Keep in mind that not all values of resistors are available. Typical values in this range are: 1,10, 22, 47, 100, 150, 220, 270, 330, 470, 510 Ohms… . Just as a note. The value of the “correct” resistor oddly enough does not vary with or without the turn signal bulbs connected. Nor is it possible (at least with LED bulbs) to make the dash indicator work like a car’s “Turn Signal Error Indicator”. By this I mean that it isn’t possible to make the dash indicator blink if both turn signals work, but stay constant if either the front or the rear bulb is defective. In theory, if one bulb fails, the remaining bulbs will only draw half the current. That’s something that the vehicle can detect. This is why car turn signals flash quickly if a single bulb is defective. Regrettably in this case, if the minimum value found to make the dash indicator work is 270 Ohm, the minimum value is still 270 ohm regardless of one or both bulbs being defective. Once you’ve found the right resistor for the turn signal LED indicator fix, install it. Once you’ve chosen the value in Ohms for the resistor, go to a Watts / Volts / Amps / Ohms calculator and input the value of Voltage and Resistance. For voltage insert 14 volts, and for resistance pick whatever value satisfies you. The calculator will return the correct Wattage and Current. The value of the current is how much electricity is wasted as heat. On the other hand, the wattage value is the minimum watt rating the resistor chosen needs to not burn up. For 14v and 270 Ohms, the current is 0.0518 Amps and the wattage is 0.7259 Watts. For this turn signal LED indicator fix, simply install the resistor in parallel with the turn signal bulb, as shown above. By parallel I mean bridge both positive and negative turn signal cables via the resistor. Though crimping is better, I’d probably just solder in this case due to convenience. Remember to use proper strain relief. Avoid the potential of short circuits by wrapping the setup carefully. You only need one resistor per side (NOT per bulb). The best place I found to install the resistors was on the lead located on the side fairings. Basically right where the front turn signals are. Simply install it inline with the cable and heat-shrink around it. You can barely tell it’s there. If you are looking for a turn signal led indicator fix, this may very well be it. It worked for me, and hopefully it will work for you, too! I hope this was helpful. But if something isn’t all that clear or your issue is different, feel free to leave a comment below. Or if you know the real reason why the LED stays constant, I’d love to hear from you. Great write up and great information! Would this solution still work if I didn’t bridge the positive and negative, but rather installed a resistor in series with the negative and positive? Also how can this solution work with a three wire set up, i.e. a negative, a constant power (running light), and a switched power (turn signal)? I’d avoid installing the resistor in series. It would work but if you do, the turn signal bulbs will receive less voltage and shine dimmer. If you install too big a resistor the turn signal bulbs wouldn’t even turn on at all. In other words it really is best practice to install in parallel to the bulb. For the question about the three wire setup, given that you install the resistor directly at one of the turn signal bulbs, it would be irrelevant and wouldn’t change anything. You still have to just attach a resistor to the positive and negative terminals of the turn signal bulb (AKA install it in parallel with the bulb).